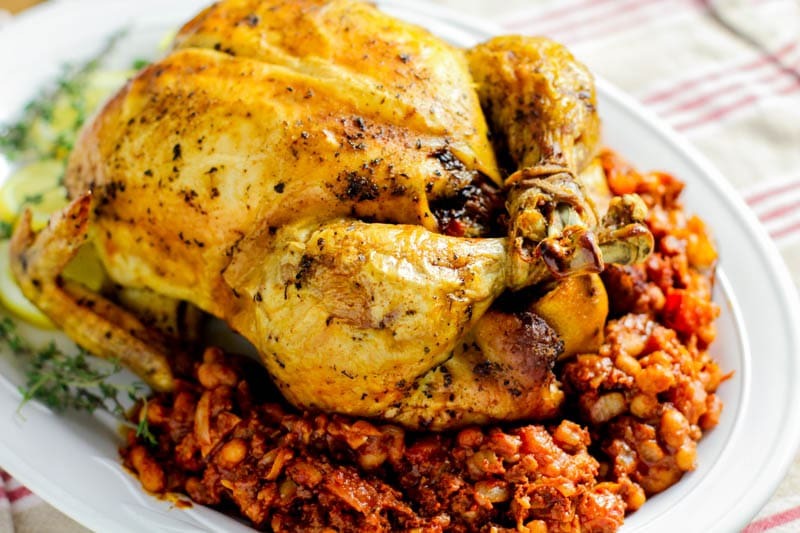 Smoky and spicy this stuffed roast chicken with beans, chorizo, and loads of thyme is the perfect whole roasted chicken recipe for your intimate get together or date night. Any Gordon Ramsay fans here?! If so, this recipe should sound familiar. It’s completely inspired by his and eerily similar. I mean, you can’t beat greatness, can you? Naturally, I’m adding a Latina twist to it. 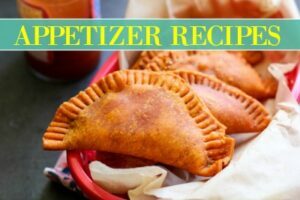 Hope you all enjoy this recipe. For this recipe, I’m using uncooked ground chorizo and a can of cannelloni beans. The chorizo adds amazing heat, but if you desire something with a little less kick, I suggest you use ground beef and add paprika to it. 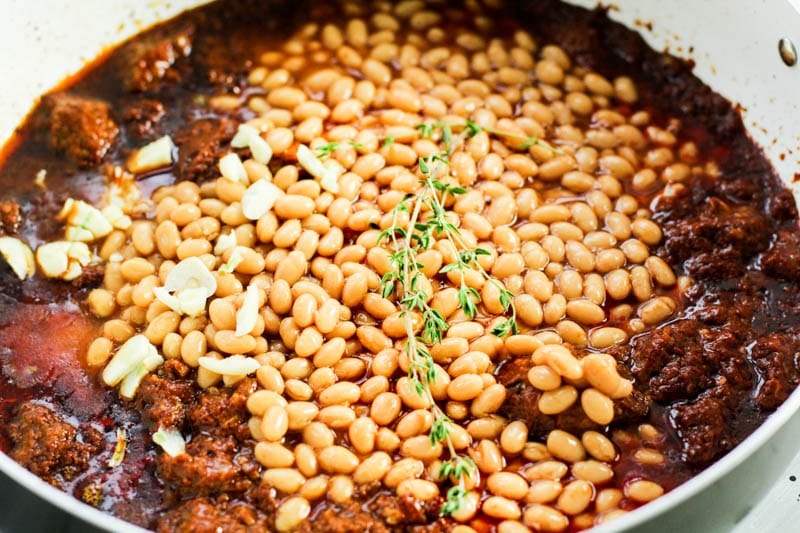 As far as beans, you can use any can that’s in your pantry. Just drain it first! First, we go ahead and cook the chorizo. I added homemade sofrito to mine to give it some of that authentic Hispanic flavor. Add in your spices, herbs, and garlic. We could never go wrong with garlic, but I suggest you taste it before adding in more since this recipe already has a nice kick to it. To help with the kick, Gordon Ramsay suggests adding in tomatoes to add in sweetness. 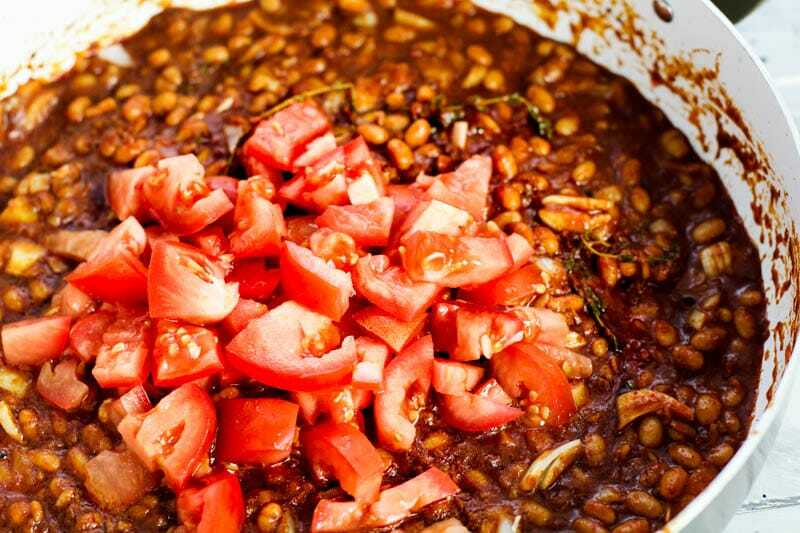 He used sun dried tomatoes, but mama had fresh tomatoes on hand, and you already know… reduce, reuse, recycle. Or in my case, pantry challenge time! Continue to cook it so the tomatoes soften and are incorporated into the sauce. Time to stuff the chicken. Remember, when you’re working with whole cuts of meat, please remember to dry the skin before seasoning it. Once your chicken is dried (and all of the insides of the chicken have been removed and the cavity is empty) it’s time to stuff your chicken. Hold your chicken legs up and fill er’ up! You will have a lot of bean mixture left over, and that is fine. You could refrigerate it for another dish or even stuff another chicken with it. Honestly, if you make white rice to the side, this bean mixture would be amazing to go over it. Add in the lemon at the end to close the cavity, and then tie the legs together. Now that the legs are tied together, we’re going to season the skin. Use olive oil first to coat the skin, and oh be sure to loosen the skin on the breast by piercing the edge with your fingers and lifting gently between the skin and the breasts to create a pocket. Add some oil and seasoning there too! For my seasonings, I added a generous amount of oregano plus more (see below). Gordon Ramsay loves using thyme in so many dishes, me? My herb of choice has always been oregano. Now that your chicken has been seasoned, it is ready to bake -almost! Next, place your chicken on a wire rack. Add fresh herbs to the bottom of the pan as well as the other half of the lemon and add 2 cups of white wine and 1 cup of water to the pan (I love Pinot Grigio, but chardonnay is recommend by the Wine and Spirits guy… just saying!). Cover with aluminum foil and roast for an hour. 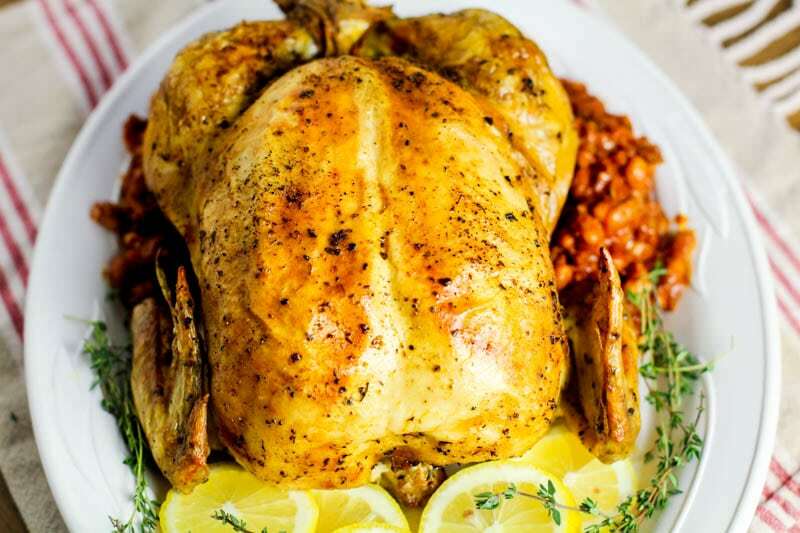 Remove foil and roast for an additional half hour or until chicken is cooked through (165 degrees Fahrenheit) and a beautiful golden color. 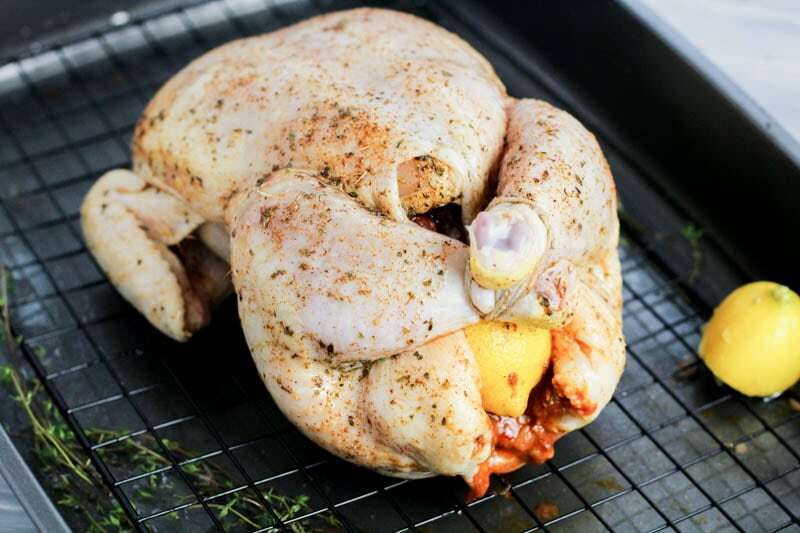 Remove chicken from the oven and let it sit for a few minutes before serving. I personally love to drizzle fresh lemon juice over it before serving too. I hesitate to say mashed potatoes only because this dish isn’t a traditional one. I highly suggest white rice, and a tossed salad. 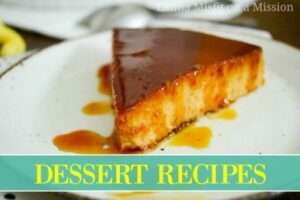 Have a good bottle of wine and end the dinner with a slice of my lemon flan recipe! That’s it mi gente! 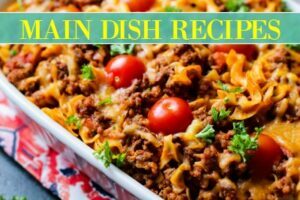 I hope this recipe finds you well, and if you’ve been sticking around you might have noticed that I have been posting here daily! Yes, DAILY! 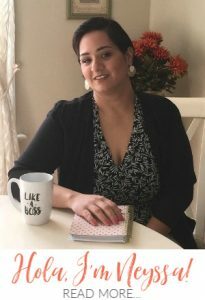 My goal is to post daily for 30 days. Then after that? I guess you’ll tell me in the comments below. 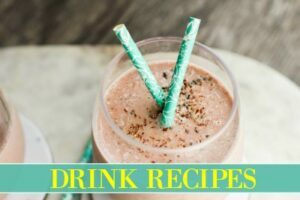 How often would you like to see new recipes posted? Buen provecho! Also, watch the great Gordon Ramsay yourself! 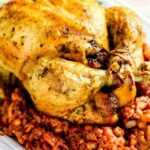 Bold, spicy, and flavorful this Gordon Ramsay stuffed roast chicken with beans and chorizo is amazing for a small adult get together or date night in meal. 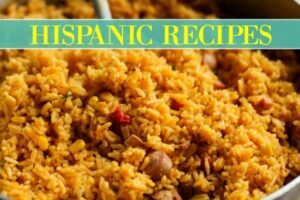 In a large pan over medium high heat, warm 1 teaspoon of oil and add chorizo, sofrito, and onions to the pan. Cook 4-5 minutes, or until chorizo is cooked through. Next, add in garlic, tomatoes, beans and 3 sprigs of thyme (whole or remove stems), and salt and pepper to taste. Cook an additional 2-3 minutes. Add the juice of half a lemon. Remove from heat. Take a large chicken, pat it dry with paper towels. Moisten the chicken with remaining olive oil and season with salt, pepper, paprika, and oregano. Stuff the cavity of chicken with chorizo and bean mixture (there may be mixture left over, put to the side to serve). When bean mixture is in, add the other lemon half, open side facing in, and tie legs closed together with kitchen twine. Place chicken, breast side up on a baking rack, in a baking dish. Add wine and water to the pan, cover with aluminum foil and bake for a hour. 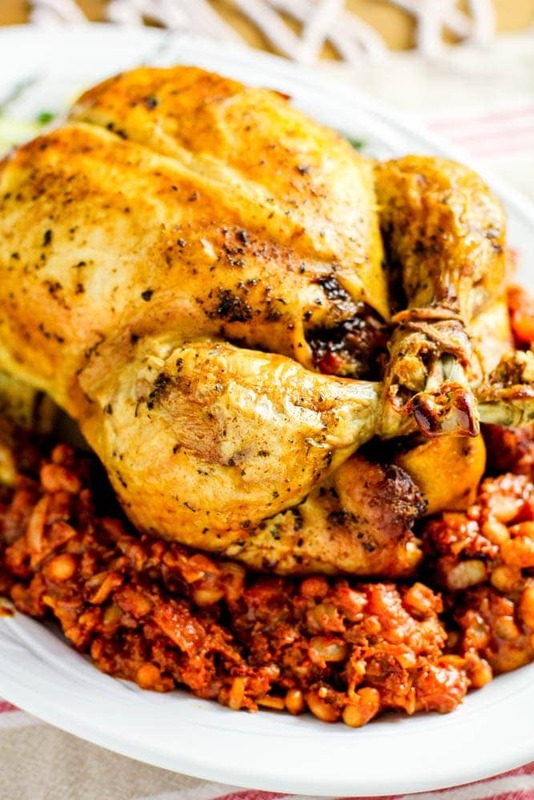 After an hour, remove foil, continue baking for a half hour or until chicken juices run clear and chicken is fully cooked.